Obama recently penned an assessment of the Affordable Care Act in JAMA; I wrote a response in Jacobin. I have an article online today at The New Republic where I take on both the political and economic arguments being hurled at single-payer. Recent weeks have seen a slew of misleading attacks on the affordability and merit of single payer health care. It’s time to set the record straight. Please see “Setting the Record Straight on Medicare-for-All: An Open Letter From Physicians and Medical Students.” The letter went up today. You can endorse the letter on the webpage. A list of endorsers will be published in the near future. Please also circulate to colleagues. This is a crucial moment in the national debate over health care reform and single payer. Today in Jacobin, I write about why single payer remains critical to the goal of universal health in the US – and why other roads will fail. Arnie Arnesen kindly had me back on her radio program “The Attitude” on WNHN 94.7 FM in Concord, NH to chat about the politics and policy and history of single payer. Podcast is available here. I have an op-ed today on why the naysayers are wrong about single-payer, available here. Chelsea Clinton isn’t just a political surrogate, she’s someone who purports to know something about public health. She is, after all, the Vice Chair of the Clinton Foundation, where – according to its website – she works on the organization’s multiple public health projects. More to the point, she is an adjunct assistant professor in health policy and management at the Columbia Mailman School of Public Health, where she earned her Masters in Public Health degree. His plan would take Medicare and Medicaid and the Children’s Health Insurance Program and the Affordable Care Act health-care insurance and private employer health insurance and he would take that all together and send health insurance to the states, turning over your and my health insurance to governors. Now I’m a single payer advocate, active in the organization Physicians for a National Health Program (though the views expressed in my articles and blog posts are mine only). If you don’t agree with the vision of a single payer program – whether because you think private insurers do a right proper job of delivering a right to health care or because your campaign receives generous funding from the pharmaceutical industry or whatever – so be it. But don’t grossly misrepresent such a system by suggesting that Sanders would “dismantle Medicare,” as Chelsea Clinton did. Particularly not when the text of Sanders’ 2013 single payer bill states, “…the 113th Congress should enact a Medicare-for-All Single Payer Health Care System…” This bill is one of several single payer bills and proposals. Representative John Conyers’ single payer bill, H.R. 676, is in fact named the “Expanded & Improved Medicare For All Act.” To suggest that a system that would provide an improved Medicare program universally to the nation would somehow sneakily rob seniors of their Medicare coverage demonstrates a rather poor grasp of the issues (or something worse). What both Clintons’ seem to be alluding to, as The Week’s typically on-point Ryan Cooper described earlier this week, is the fact that Sanders’ 2013 bill configures a single payer plan that would, to some extent, have a state-based administrative structure (though it would still be a federal plan and be implemented in every state). Cooper contends that there are some reasonable objections to such a structure, and that perhaps an entirely federal plan might well be superior. Yet these are relatively minor details. To characterize Sanders’ single payer platform as some sort of dispersal of health care to the whim and fancy of each individual state is fantastically inaccurate. Sanders’ has proposed a fundamentally universal system: a national health program that would cover essentially everyone in every state. At that point, we wouldn’t need a separate Medicaid or Medicare program (or private insurer), which is the raison d’etre of “single payer.” Such a system would be far more just and equitable than what we have now, where – even with the Affordable Care Act largely intact – 32 million remain uninsured and another 31 million underinsured, among other failings. Of course, such issues will never be a problem for Chelsea Clinton, primarily because she is part of a fabulously rich family. Indeed, as the Intercept’s Zaid Jilani described yesterday in a good piece entitled “Hillary Clinton’s Single-Payer Pivot Greased By Millions in Industry Speech Fees,” Hillary Clinton has raked in a cool $2.8 million in speaking fees in the past two years from the health care industry alone. Jilani also notes that Bill Clinton gave a speech (one presumes for a hefty fee) last year for America’s Health Insurance Plans, the main lobbying group for the health insurance industry. And Chelsea Clinton herself is already able to command $65,000 per college speaking gig, according to the Washington Post. Like her parents, in other words, Chelsea Clinton is unlikely to go broke from a sky-high deductible or because she inadvertently went to an “out-of-network” doctor or hospital; she’ll never be forced to choose between filling a prescription and paying for rent. Nor should she – nor should anybody. But obviously that’s no excuse for a campaign surrogate (much less an adjunct assistant professor of health policy and management) to so grossly mischaracterize a rather familiar health reform proposal, particularly not one that has the potential of improving – indeed saving – the lives of so many. Today in Jacobin I take on the case of skyrocketing pharmaceutical prices – exemplified by the price hike of pyrimethamine – and discuss how we might create a more just pharmaceutical framework. Our multiplicity of insurers forces US hospitals to spend more than twice as much as Canadian hospitals on billing and administration; forces US physicians to spend vast amounts on billing; and nourishes a panoply of business consultants, coding software vendors, and other satellite business. So had a new study been published demonstrating, contrary to all existing data, that private insurers somehow had lower administrative costs than Medicare? Had Canadian expenditures on healthcare administration somehow suddenly vaulted ahead of that of the United States? No, neither had come to pass (not surprisingly). In fact, Dr. Accad doesn’t really deal with any of the literature about the administrative efficiency of different types of health care systems. Instead, he employs a “Hayekian perspective” to make the argument that central economic planning is inherently inferior to an atomized free market where individual economic actors buy and sell, rationally relying on their intimate knowledge of local market circumstances. “Only in a decentralized system,” he argues, “of decision making, where price fluctuations can adjust to the reality of needs and provisions, are major gluts and shortages avoided.” (i.e. no one knows the business of bread making better than the bread maker, etc. etc.). Now on the one hand, it’s a bit quixotic to invoke the political philosophy of a neoliberal economist to argue against what is essentially empirical point, i.e. 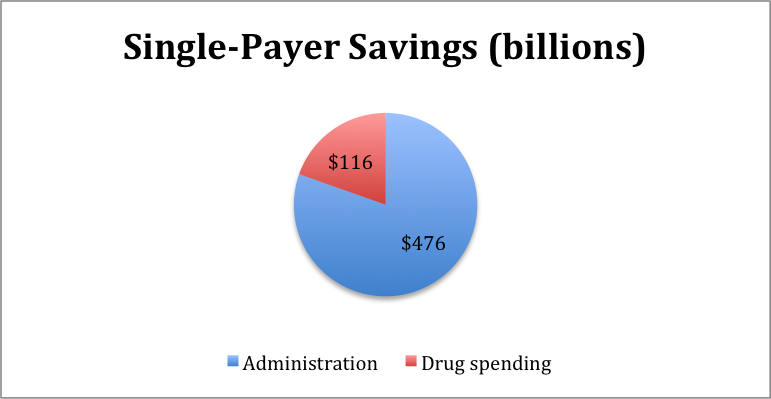 that the United States spends more on health care administration than nations that have a single-payer system. For it clearly does. To review, one 2003 study published in the New England Journal of Medicine found that the US spent about three-times as much as Canada on health administration ($1,059 vs. $307 per capita, in 1999). More recently, a study published in Health Affairs found that the US had the highest hospital administrative costs among eight high-income nations (an astronomical 1.43% of GDP spent annually on hospital administration in the US, as compared to 0.41% in Canada). Closer to home, Medicare – a single-payer-like system for older Americans – has an administrative overhead around 2%, as compared to the 13.6% in overhead and profits of privatized Medicare Advantage, which is run by private insurers. No, it can’t, but that’s not what such codes are used for: they’re used to determine reimbursement. But they don’t have to be – and that’s where the administrative savings come in. Under a single payer system (as PNHP’s proposals describe), hospitals would receive a global lump sum budget to pay for all operating costs; there would be no need to monitor services used by individual patients, tabulate costs, or hire debt collectors. Indeed, hospital billing could largely be eliminated from the ledgers of hospital operating expenses. Simplified fee schedules, capitation, or salaries – without bonuses or penalties for more or less health care use – would be used to reimburse providers in the outpatient sector. The name of the game would be “[s]implicity, simplicity, simplicity!”, as one prominent New Englander put it in his important defense of a national single-payer system, Walden. I share what I sense is Dr. Accad’s bitterness at onerous documentation obligations. But a universal system would make much of that documentation irrelevant, and therefore unnecessary. It would therefore be a win both for practitioners and for the public (though it would admittedly be a loss for many others, including those who profit from the system’s inefficiency, e.g. the health insurance industry). “Reducing administrative waste” may or no not be the heady revolutionary slogan that today’s millennial physician-activists are looking for, but it’s no less true for that – whatever the unrelated musings of Hayek or Henry David Thoreau. Note: Updated to note that the “global lump sum budget” is described in PNHP’s proposals. Note 2: A version of this post has been published on KevinMD.com. “However the Supreme Court rules, Obamacare isn’t enough. We need a more fundamentally egalitarian health care system.” My article on the meaning and implications of King v. Burwell in Jacobin.